Cody Macfie, "Masonry Complete: Expert Advice from Start to Finish"
Installing a beautiful walkway made of pavers, creating a dramatic brick-covered wall, or even repairing foundational cracks to preserve your home—projects like these are easier than ever for DIY-ers with Masonry Complete, today’s most comprehensive reference on masonry. 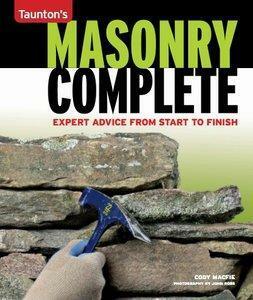 Written for both beginner and advanced home improvers by a second-generation stonesman, this complete masonry guide delves deeply into everything, including buying the right tools, setting up safety precautions, digging a footing, pouring concrete, building a stone fireplace, repairing old masonry, and more. With Cody MacFie’s step-by-step approach and you-can-do-it attitude, readers will feel empowered and confident to tackle any project, deal with challenges should they arise, and proudly net a finished product in less time than imagined.